From August 29th to September 11th, I joined eight other artists for the Matza Aletsch expedition residency on the largest glaciers of Europe. We trekked up the great Aletsch Glacier, to Konkordiaplatz, where four glaciers meet up and give birth to the Aletsch Glacier. Konkoridaplatz means plaza of harmony, from the Latin concordia, or “with (one) heart,” a name that fits well with my mission to bond with the glacier and with the group. I went with the intention of communicating with the glacier, through a series of performances, and to examine and sing to microbial life on the glacier and in the air. See Explaining a Bosch Triptych to a Dying Glacier and Drachen of Aletsch for details on two of these performance projects. 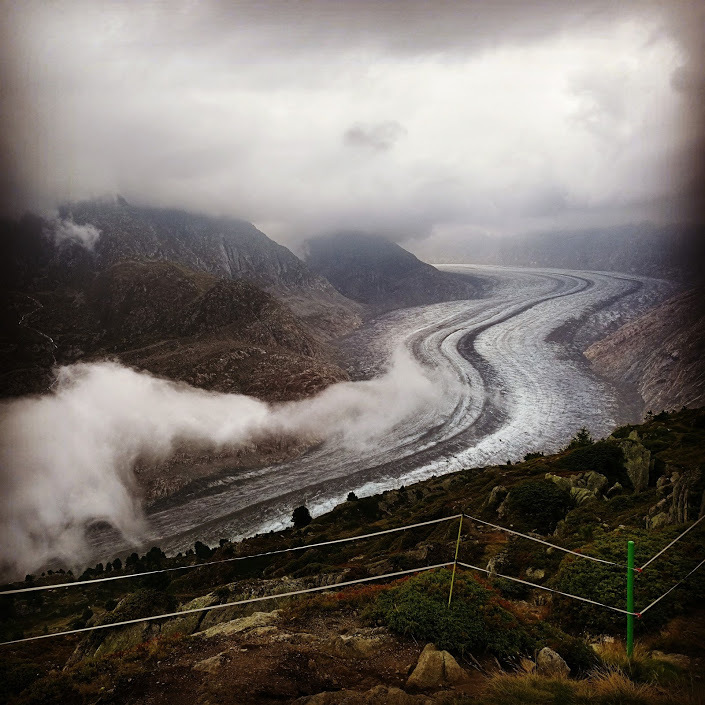 Since the late 1800’s Aletsch has melted dramatically fast, due to climate change, dropping 200 meters and retreating 3 kilometers (Wikipedia), and without these glaciers important rivers in Europe would run dry, including the Rhone. Two long days of hiking up the mountains and down the valleys, over giant swinging metal bridges, past braying goats and sheep, and cow bells clink in the alpine air. We witness the turquoise waters rush from the Glacier’s mouth, down the Glacier-carved valley, toward the Rhone. Water, water is good, water is great, water is life. The Glacier appears from different vantages, reveals herself in all her splendid power, coiled, curving, and slowly moving downward, carving the rock. Fog and rain accompany us today. As we climb to the first cabin above Aletsch, we can only see the path in front of us and only sense the presence of the Glacier down to the left, breathing slowly, awaiting its next recharge from the winter snow. The fog parts now and shows us her ridged white, grey and brown scales, ice waves undulating at an imperceptible speed. Plants! Green accompanies us. Before reaching the glacier, we hike up the mountain through a relatively untouched pine forest, with baby pines sprouting from old moss-coverd logs. Tiny succulents form miniature landscapes with moss of many forms. Flourishing blueberry bushes abound above Reideralp. We forage, worlding into the landscape by eating. Later, bogs with grass and methanogens dapple the landscape between giant stones. Up above, many lichens grow on every rock, bright light green splotches with black edges predominate along with large blue-grey circles.